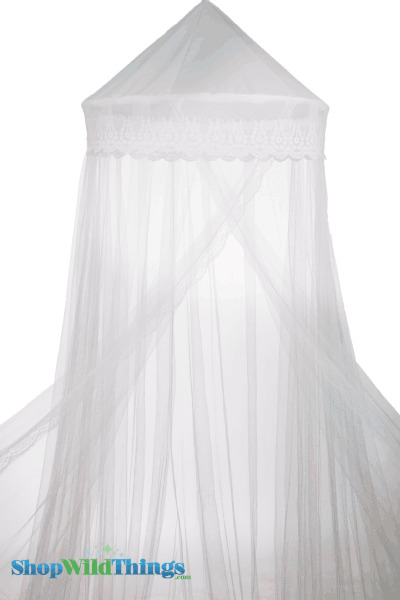 Our adorable "Gibson Girl" white mosquito net canopy features a lacy top that really adds sweet detail! The sheer fabric netting adds beauty, drama and allure to any room. Try canopies indoors and out. We are even seeing them used on cake tables for weddings, parties and other events! 100% Polyester Netting-White, top folding metal ring 2' ring diameter x 8.2' long x 39.4' fabric circumference. Mounting hardware included. 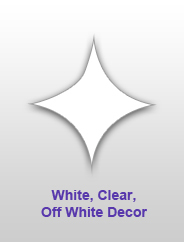 - We also offer a huge selection of matching accessories like beaded curtains and lamps that will really help you to tie the look of your room together! - We also offer a huge selection of matching accessories like beaded curtains and lamps that will really help you to tie the look of your room together! Very cute. Just as pictured! ProsJust as advertised, in fact, I ordered 2 different ones, one for her house and one for her room at her dad's house. Both were just lovely. Lovely Lacy Canopy for baby to be! My daughter-in-law wanted this for her baby to be so I ordered it and it is just LOVELY! I got to see it hung at their home in North Carolina and it just makes the nursery look so sweet and magical. And, the price was JUST RIGHT! Granny will certainly shop again. Many thanks!